Although 16% more Single Family homes came onto the market in June, 2016 than in June, 2015; the total inventory of homes for sale was 31.3% lower than last June. With lower inventory, June buyers this year paid 97.3% of list price, exactly 1% higher than the percentage of list price paid during June, 2015. This percentage may seem small, but it has pushed the median sales price for June purchases up by 20% for June, 2016. In the realm of townhomes & condos, there were 6.6% fewer new listings in June, 2016 than in June, 2015. For the year overall, inventory has been down by 8.4% and the what is available is disappearing quicker than ever. 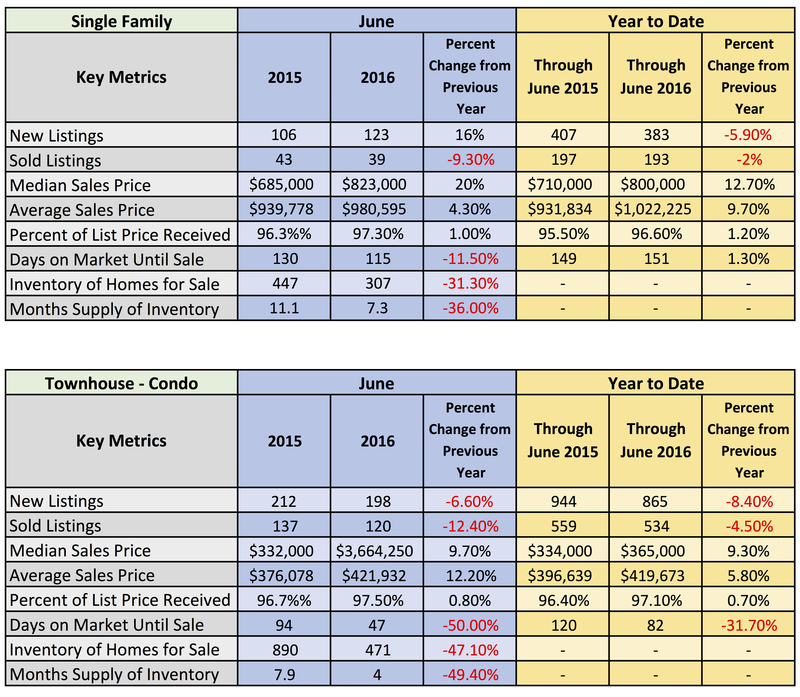 Condos and townhomes sold in June, 2016 lasted exactly half the amount of days on market as they did during June, 2015. This is on par with the trend we’ve seen during 2016 with inventory spending 31.7% fewer days on market than the inventory of 2015. Not only are properties disappearing faster, but they are also receiving a higher premium — with the average sale for condos & townhomes 12.2% higher during June, 2016 than June, 2015.